22.50: Leicester sign Aleksandar Dragovic on loan from Bayer Leverkusen. 22.35: Farhad Moshiri, Everton’s majority shareholder, confirms Barkley changed his mind and will reassess options in Jan.
22.23: Arsenal’s Joel Campbell to Real Betis on loan. 21.50: Danny Drinkwater is at Chelsea’s training ground, ready to sign, but the clubs still need to shake on the fee. 21.09: Jason Denayer has joined Galatasaray for a second loan spell from Manchester City. 20.24: Callum McManaman having a medical at Sunderland, as is the Bournemouth defender Marc Wilson. 20.14: Nikola Vlasic to Everton. The Hajduk Split forward is a really exciting prospect at just 19. 19.34: Brighton have signed Ezequiel Schelotto from Sporting Lisbon. 19.32: Alexis Sanchez will be staying at Arsenal. 19.22: Jota has signed for Birmingham in a club record transfer fee. 19.04: Rafa Benitez has been described as “frustrated” with Lazaar departing and Paul Dummett injured he is without a fit specialist left back. 18.25: Without signing Lemar, Liverpool have been insisting that Coutinho will be staying at Anfield. However according to Sun Sport, there will be an announcement at 7pm that Barcelona have made a FOURTH bid of around £138million that Liverpool could not say no to, as the Brazilian international is determined to move to the Nou Camp. 18.15: With just under five hours left on the transfer window, it appears that Thomas Lemar will stay at Monaco. After an audacious £92m bid Arsenal have pulled out of any more offers, and Liverpool are no longer in the race it appears, even though he reportedly preferred their approaches meaning he can still play Champions League football. Arsenal fans will probably settle for no more incoming players as this deal was only ever likely to happen if Alexis Sanchez was going to Manchester City. 18.00: Zappacosta is on his way to Chelsea. 16.00: Alexis Sanchez’s transfer to Man City is looking unlikely after Arsenal feel they won’t have enough time to find a suitable replacement. City made a bid of around £60 million for the Chilean, which it seems would be accepted by Arsenal, if they had enough time before the deadline to replace him. Thomas Lemar and PSG midfielder Julian Draxler would be ideal signings for Arsene Wenger if they sold Sanchez to City, while Riyad Mahrez has also been linked to the Gunners. Arsenal have prepared a £90 million bid for Lemar after having two bids already rejected by Monoco, while Draxler is said to have no further requirements at PSG following the arrivals of Neymar and Kylian Mbappe. It seems that these exciting transfers may just be beaten by the clock, with the window closing at 23:00 tonight. 15.40: West Ham have had a poor start to this season, losing all three of their games. This poor start has surprised many given the number of high profile signings they’ve already made; Joe Hart, Marco Arnautovic and Javier Hernandez to name a few. The Hammers though are seeking more, they’ve had a loan move for Everton midfielder Kevin Mirallas rejected, but there remains interest there. It had been reported last week that a deal for Portugal midfielder William Carvalho was nearing. However Carvalho’s club Sporting Lisbon want around £40 million, while West Ham are only prepared to pay £33 million. Should West Ham miss out on the Portuguese international, as we reported earlier, another Portugal centre midfielder could be on his way to Slaven Bilic’s team, should Andre Gomes make the move from Barcelona. 15.30: Arsenal fans need some positive news on this deadline day. Although they haven’t signed anybody yet, it seems that German centre back Shkodran Mustafi is set to stay at the North London club. Mustafi only joined the club last year, but it had been reported that a move to Inter Milan was to take place. However after failing to reach Arsenal’s figures for a loan move, the deal seems off. Arsenal fans will be breathing a sigh of relief hoping not to lose another one of their players. 14.55: Tottenham certainly are having a busy and positive deadline day, after already securing the signing of Serge Aurier, and the imminent one of Fernando Llorente, they’ve been linked to lots of other names, including Barcelona central midfielder Andre Gomes. The former Benfica man signed for Barcelona last summer, but has struggled since moving to the Catalan club, lacking a genuine amount of game time. West Ham are reportedly interested in making a move for the Portuguese international, so Spurs will have to face competition if they want this signing. 14.45: Leicester might not only lose Mahrez today as Demarai Gray has attracted a lot of interest from a few English clubs. Tottenham, Crystal Palace and Bournemouth all wish to sign the youngster, with the latter already having a bid rejected. Should either Mahrez and Gray leave, Leicester have identified Ccrystal Palace winger Andros Townsend as a replacement. Townsend, currently at Crystal Palace, is an experienced Premier league player, who would be a more than capable replacement, should Leicester lose either Mahrez or Gray. 14.30: Having just missed out on Rafinha, Chelsea have acted fast and have reached an agreement to sign Torino right-back Davide Zappacosta. Conte is desperate to sign a right wing back, and according to Sky in Italy, the Italian right back should be joining Chelsea before the end of the deadline. 14.20: Chelsea’s disappointing deadline day is set to get worse, after a bid for Bayern Munich right back Rafinha has been rejected. Having missed out already this summer on Lukaku and now Oxlade-Chamerlain, Conte will be desperate not to miss out on another one of his targets. No second bid for the Brazil international has been made as of yet. 14.00: Sky Sports News report that Man City have made an improved offer for Alexis Sanchez, estimated to be worth in the region of £60 million. 14.00: Renato Sanches has completed a remarkable season long loan move to Swansea, and will link up with his new team mates following international duty with Portugal. 13:00: Spurs confirm purchase of Serge Aurier from PSG for £23 million. BREAKING NEWS: Arsenal have made a £25M move for United's fax machine. They think it'll stop Alexis Sanchez moving. NOT FOT SALE!!! Man City still want to sign Alexis Sanchez, after having a £50 million bid rejected. City remain very keen and are rumoured to be preparing a higher bid in the region of £70. Sanchez has expressed his desire to leave the Emirates after the recent 4-0 loss to Liverpool, by handing in a transfer request. Moving to City would see Sanchez reunite with his former Barcelona boss Pep Guardiola, but whether or not this move happens is dependant on weather Wenger is willing to sell the Chilean international. It is being reported that club officials of City are in Chile to organise this transfer, which more than likely will take place before tonight’s deadline. Losing Sanchez would be a huge loss for Arsenal, considering they’ve already lost another one of their attacking midfielders, as Alex Oxlade-Chamberlain has completed his transfer to Liverpool costing £35 move. A six year deal is said to have been agreed for the former Southampton man, who was originally meant to join Chelsea after a deal had been agreed. However the player chose instead to join Liverpool, after admitting that he would like to play a more central midfield role, rather than a right wing back where Chelsea would have employed him. One club that are likely to have a very busy deadline day are Tottenham. One would think Harry Redknapp was still in charge after being linked with Swansea striker Fernando Llorente and PSG right back Serge Aurier. It is being reported that the transfer of the Ivory Coast right back is imminent after a deal had been reached between the two clubs. Aurier had been heavily linked to Man Utd earlier this window, but now it appears he’ll be heading to the London side, who were in desperate need of a right back following Kyle Walker’s move to Man City. Tottenham’s business doesn’t end there though, as they have agreed a deal with Swansea to sign Spanish striker Fernando Llorente. Chelsea appear to have missed out on another one of their targets, as a deal was agreed Wednesday morning, according to reports. Although Harry Kane will surely remain as Tottenham’s main striker, last year’s runners up had been interested all summer in bringing in another striker to support Kane, with Vincent Jansson failing in England so far. Swansea though already have found a replacement in Man City forward Wilfried Bony, who is currently having a medical at the Welsh club. This would see Bony rejoin Swansea after leaving the club in 2015 to join City, where he has struggled, scoring just six goals for the club. 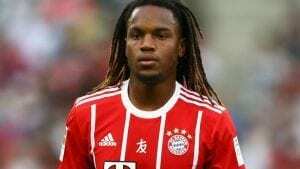 Swansea’s business might not be done there, as they are about to pull off one of the biggest shocks in this transfer window, by securing Renato Sanches on loan from Bayern Munich. The Portuguese international signed for the German champions last year, but has since struggled to break into the first team, predominately featuring on the bench. Sanches has been linked to a host of European clubs, in particular AC Milan and Monoco, while also being rumoured to join Man Utd and Chelsea, which explains why it would be a huge shock for him to join Paul Clermont’s side. However being guaranteed regular first team football by his former coach was something that convinced Sanches to move to Wales, a huge deal for Swansea, who would be hoping for a stronger season than last year. One of the sagas of this window has been that of Riyad Mahrez and his potential move away from Leicester. The PFA Player of the Year in 2016 has mainly been linked with Roma, who have had three bids rejected for the Algerian, the last of which was said to be around £32 million, but Leicester value the player more around the region of £40-50 million. Mahrez has been given permission to leave his national team camp to resolve his future, with Chelsea and Arsenal being extremely interested as well. Mahrez has expressed his desire to move away from Leicester, so it seems highly likely he will be playing his football outside the King Power stadium this year, the only question being which club? Other potential transfers that could take place today include the transfer of West Brom centre back Jonny Evans. The former Man Utd defender has attracted the interest of Man City, Arsenal and Leicester this window. Both Leicester and Man City have had bids rejected for the Northern Ireland international, with West Brom stating they will only sell Evans, if they find a replacement. Potential replacements include Eliaquim Mangala and Mamadou Sakho. Mangala is more likely to join Frank De Boer’s Crystal Palace though with a bid for the Man City defender being made. The scramble for defenders is likely to carry on all day until the deadline at 11:00 PM tonight.